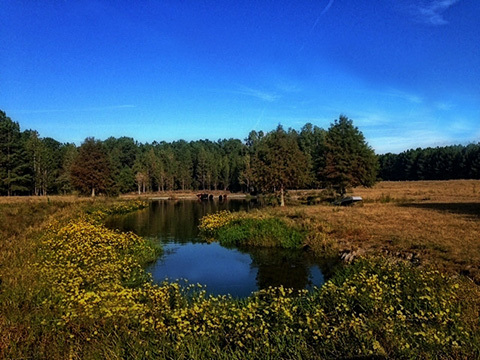 Come hog hunting with us in Barbour and Henry County, AL and enjoy some of the finest wild hog hunting on the eastern edge of Alabama’s famous black belt. We are located in Eufaula, AL, 50 miles north of Dothan, AL and 85 miles east of Montgomery, AL. We have several different tracts of land, ranging from river bottoms, hills, hardwood bottoms, clear cuts, and pines. All of our properties are private land with the game being intensely managed. Our hunting lodges are clean and comfortable. Both hunt lodges include furnished kitchens. Hunters should bring their own food or plan to eat at nearby restaurants, or we can cater your evening meals with some of the best southern food you will find anywhere. 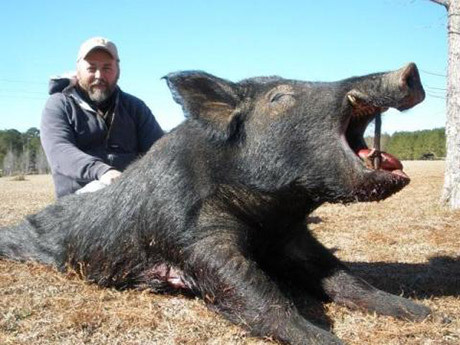 Wild hog hunting in Alabama is quickly becoming a favorite pastime for our guests. Many sportsmen have learned that wild hogs, especially wise old boars and sows, are as challenging to hunt and harvest as that wise old buck or gobbler. To combat what many consider a menace to deer and turkey habitat, Alabama has virtually unlimited hog hunting seasons and bag limits. The result for sportsmen is a great opportunity to take an additional trophy home while deer or turkey hunting, plus put some tasty pork in the freezer. Those who target wild hogs specifically will welcome the additional hunting opportunity that these feral hogs provide. Hogs have a great sense of smell, so have the wind direction in your favor. Set up near water holes and wallows. Midday is a great time for hunting hogs; we see lots of them in the middle of the day. Because hogs are populating at an alarming rate, our hunts in Alabama and Georgia constantly have an open season. Hogs tend to be a more aggressive hunt. Extreme caution is always warranted as they are more prone to attack. With the possibility of attack, your weapon of choice is important. The correct caliber of bullet is essential in guaranteeing a kill. Hogs are more likely to attack when wounded. Always make sure your boar or sow is dead before approaching. Sometimes, a seemingly dead hog may simply be wounded, and injury can occur if you get too close.